These plots combine the high and low mass searches for Higgs. If the black line goes below one they can exclude the Higgs mass range at the 95% confidence level. Both plots just fail to do that. On Monday a final talk will combine these two plots and the result should be some exclusion around the 160 to 170 GeV mass range. 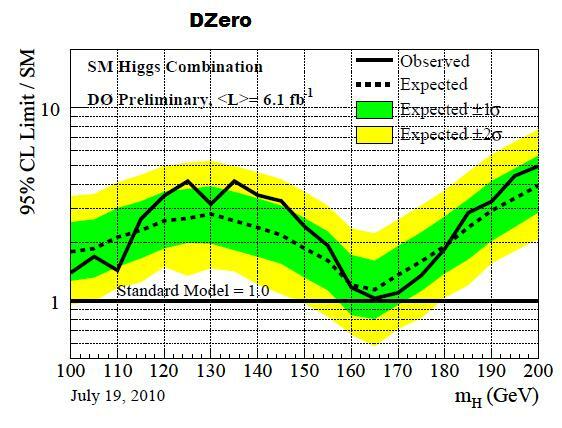 The DZero plot has some hint of a signal for lower mass, but not enough to count. The CDF has even less signal. Combining these plots properly is a complex process but it is difficult to see how a signal at 3 sigmas could be reached. I am guessing that Monday’s talk will therefore go no further than an exclusion that is a little bit better than previous limits. Hopefully someone who is able to see these two talks this afternoon will be able to report if there is anything that sounds more optimistic. 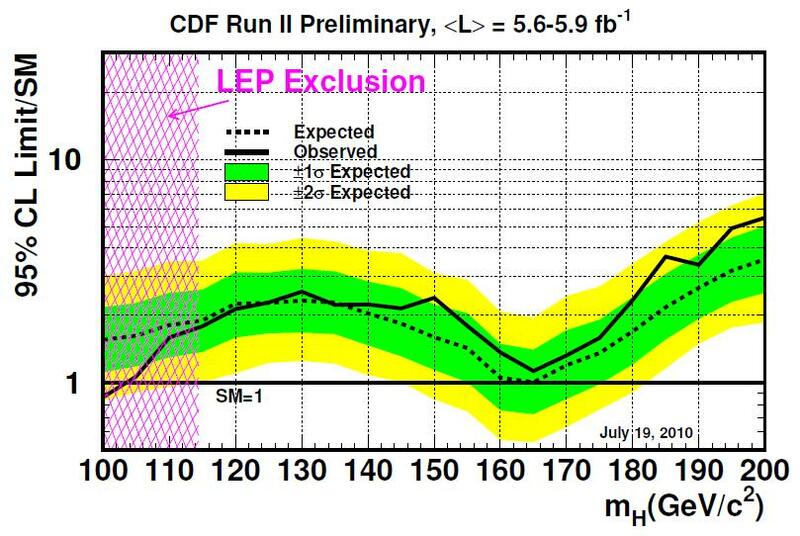 This entry was posted on Friday, July 23rd, 2010 at 1:17 pm and is filed under ICHEP, Tevatron. You can follow any responses to this entry through the RSS 2.0 feed. Both comments and pings are currently closed. Anyone who is desperate enough can easily spot a Higgs boson at 150 GeV/c2 in the CDF data, and two Higgs bosons at 125 and 135 GeV/c2 in the DZero data! They both have obvious Higgs bosons at 185 and 195 too. Remember we are looking for five of them.